This news is redirected by The Secretariat for Development Cooperation at SCIENCE from Department of Nutrition, Exercise and Sports. 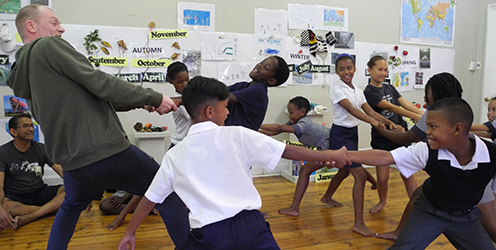 In 2017 the Department of Nutrition, Exercise and Sports and the Department of Arts and Cultural Studies, both University of Copenhagen collaborate with the Danish Cultural Institute, University of Cape Town School of Dance and the Peter Clarke Art Center in Cape Town about an educational research project on sustainable development and different art forms involving school children from Cape Town and Copenhagen. The project explores different ways of integrating dance and visual arts working with the UN 2030 Goals for Sustainable Development. Specifically it focuses on learning about how culture and nature influences each other both North and South of Equator. The first part of the project took place in South Africa February 27- March 4 2017. During this week South African children from grade four (10-year olds) explored the seasons and the elements of nature and how they as human beings both make and receive imprints in the world. They did this, for example, through various dance exercises which gave them experiences of specific qualities of air, water, earth and fire and choreographic tasks which were about finding ways of expressing the experienced qualities. The children made imprints using different body parts in soil and saw how their imprints were different, but also that after making the imprint they had soil on the body part which had made the imprint – so both the earth and they themselves changed a little by doing this. 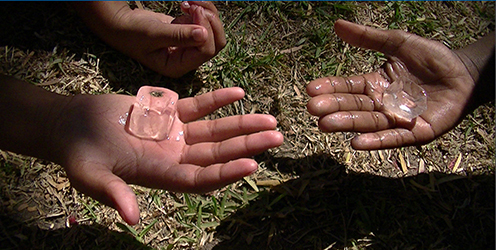 The children also tried to hold an ice cube in the sunlight and observed how the frozen water changed its shape while melting. Afterwards the children tried to use the melting sensation to create physical expressions of melting shapes, alone and with a partner. The week ended with an open performance for families and teachers and a research seminar at the University of Cape Town School of Dance. How can the arts contribute to promoting the cultural dimension of the UN Sustainable Development Goals? One overall purpose of the project is to explore how the artistic-educational areas can contribute to promoting the cultural dimension of the UN Sustainable Development Goals. More specifically the purpose is to create knowledge about the following questions: What can children learn through artistic-educational collaborations about themselves, others and their surroundings? How can connections be created through the children’s experiences and expressions as artistic forms and as alternative ways of reflection and documenting learning? And how can the methodological considerations of the research and teaching collaborations be shared with a broader range of professionals? The project will result in descriptions of ideas and models which for example can be used to reach the goals of Open School collaborations, a focus area of the Danish school reform from 2014. The ideas and models are developed by artists collaborating across art forms and across nationalities which at the same time collaborate with researchers about exploring ideas for intercultural teaching in the artistic-educational areas. They all also engage in describing strategies for a collaborative research design in the cross over between the art forms, cultural and educational studies. The project will be carried out in a similar way at a school in Copenhagen in September 2017 involving the artists and researchers from Cape Town. 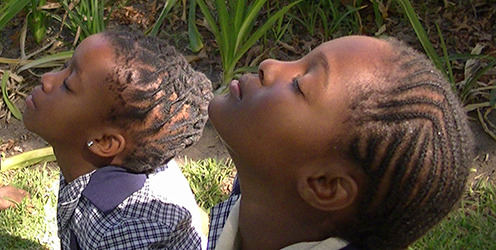 Children sitting focusing on sensing the air against their faces. The educational project is arranged by the Danish Cultural Institute with funding from the Danish Agency for Culture and Palaces. The research dimension is part of the North-South collaboration between the University of Copenhagen and the University of Cape Town titled ”Knowledge Production, Archives and Artistic Research” funded by the Danish Agency for Science, Technology and Innovation, the International Network Program. For more information contact Charlotte Svendler Nielsen.